I will begin by asking that you please excuse the shoddy camera work. The photos taken here were done quickly, with the food shots taken in the car so the lighting and focus didn’t always work to my advantage. 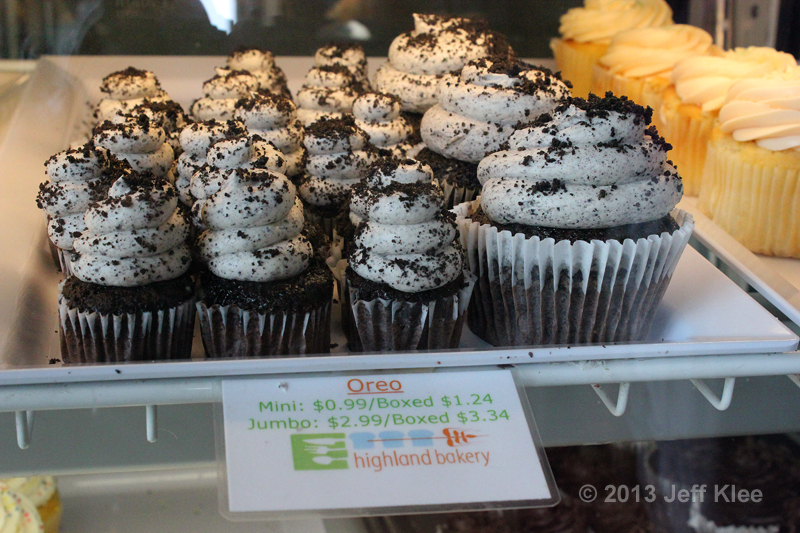 After a disappointing meal at the Radial Cafe we decided to head down the street to Highland Bakery. Atlanta has three locations. 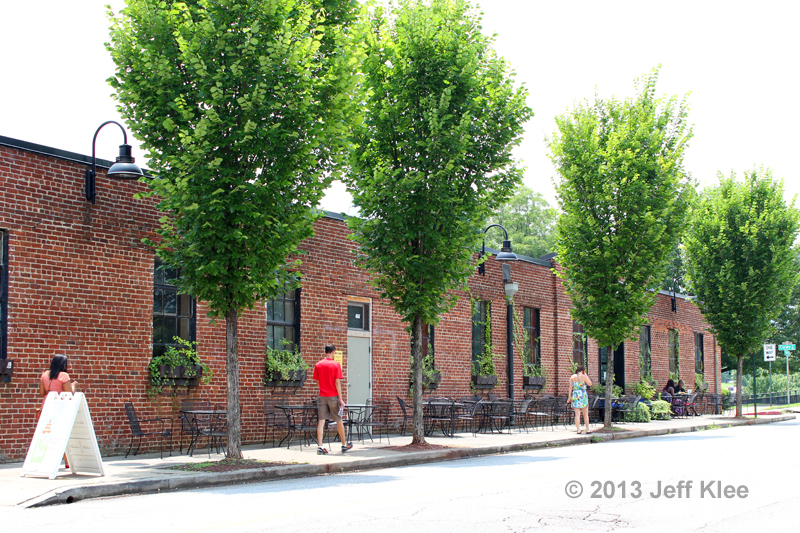 I’ve been to the other one for breakfast, rated #176 of 1,378 restaurants in Atlanta on TripAdvisor, and loved it. The one we visited today is the original, and rated #38. Today’s trip was just for bakery items, a dessert run for the aforementioned lunch we just finished. 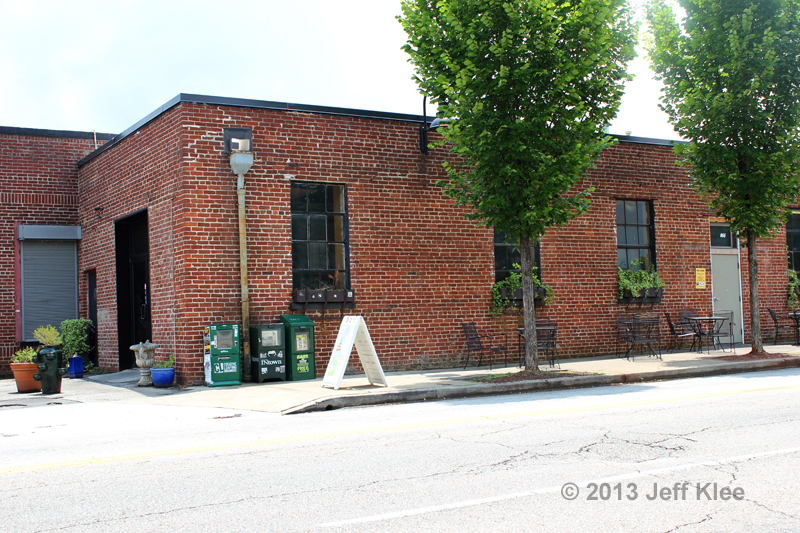 The outside of the building is once again a warehouse/office looking space with almost no signage advising that you’re arriving at a very popular bakery. Alongside the building are tables for those that want to enjoy their baked goods outside. All table service for those wanting to order a meal is inside. This may be the second location to eventually get a full review of the entire place. I will try to pick up various items whenever I’m in the area until I hopefully get a chance to try most everything they offer. Let’s step inside and see what’s available in the cases. Immediately inside the front door there are a couple tables to the right were patrons can also nibble on their take-out treats without going outside, and also without taking up a dining room table. 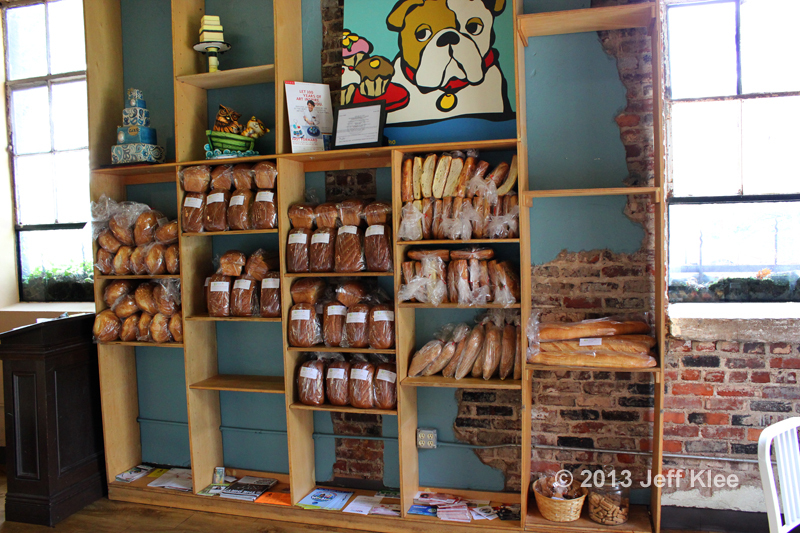 Just past the tables are large shelves holding the fresh baked bread for the day. Looking to the left is the first of three bakery cases. This one is most entirely consisting of cupcakes and one group of tarts. 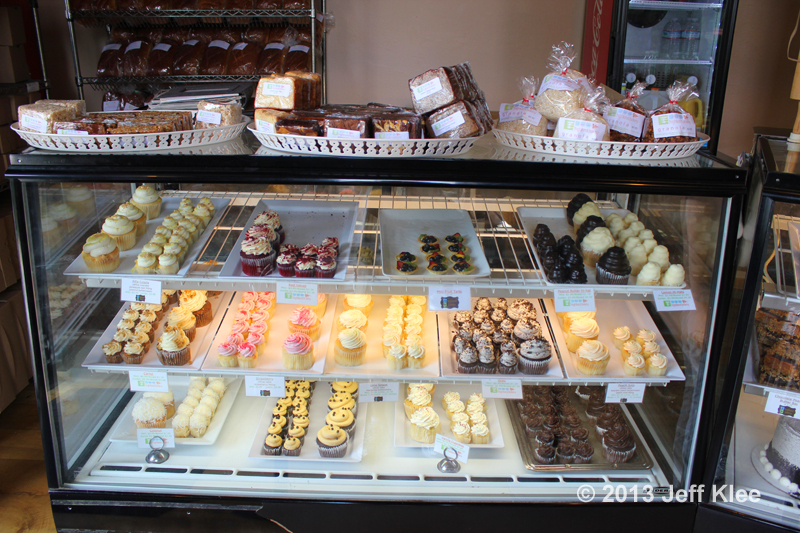 Above the case are packaged treats, such as Rice Krispy® treats, brownies, pound cakes, banana bread, and granola. Behind the case is additional storage for the breads we saw on the shelves on the other side of the room. Most of the cupcakes and other treats have a regular size and a mini size. The next case is a large assortment of various bakery treats from eclairs to tarts to bars, and even cakes and mini cakes at the bottom. 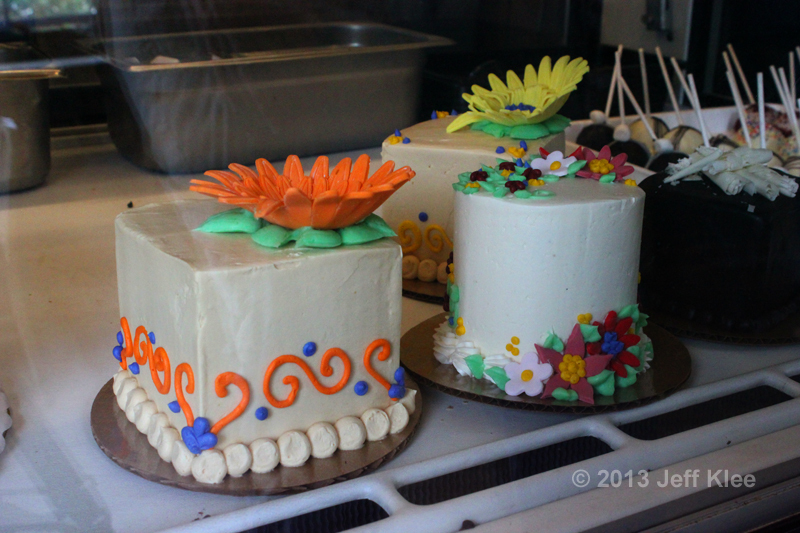 Here is a look at the mini cakes. The last case contains what they called the breakfast items. This includes cinnamon rolls, muffins, bagels, and croissants among other things. I noticed the cinnamon rolls looked very similar to the one I had earlier. I decided to pass, even though it’s something I would normally have to try. 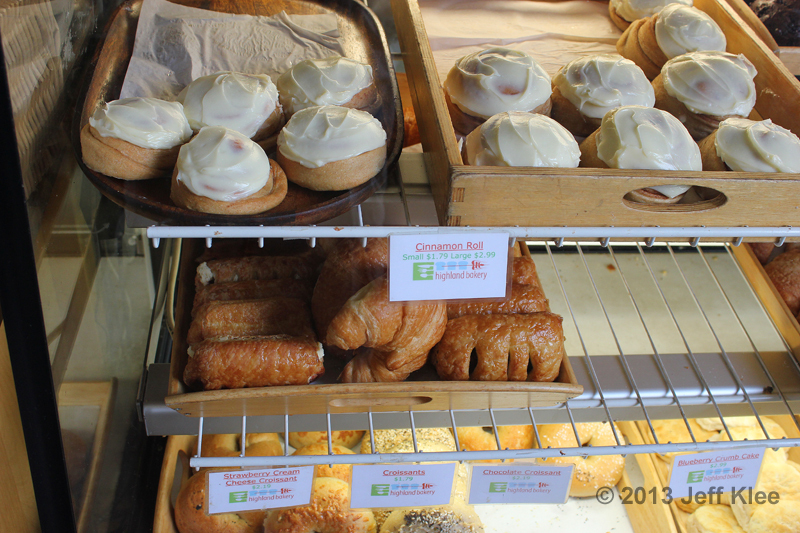 There is also a tempting choice of varied croissants with different fillings. On the back wall is a board with the pricing for breads and drinks. 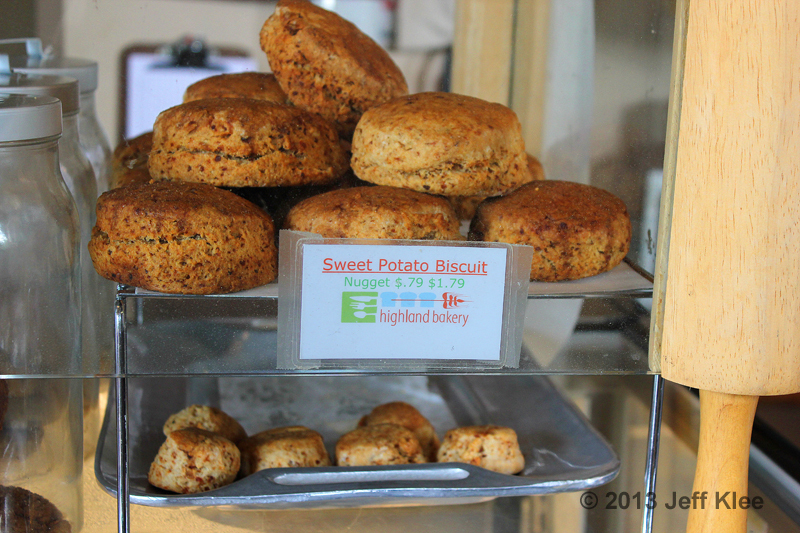 One of the items that caught my wife’s eye were the sweet potato biscuits. Generally at home, a sweet potato biscuit would be made without using wheat flour, so it would be gluten-free. We had to assume that these had gluten, so she chose a nugget instead of the full sized version. She’s a fan of just about anything made with sweet potato. 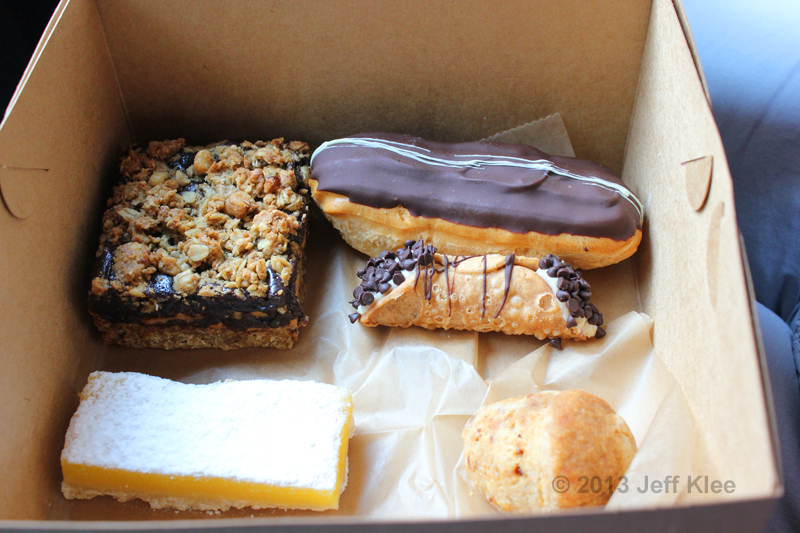 The other items we chose were the lemon bar, a cannolo (a little known fact that this is the correct singular form of cannoli), an eclair, and the chocolate peanut butter bar. Trying to avoid excess sugar and more importantly, gluten, my wife was going to try a bite of each and leave the rest for me to finish. You see why I married her? First up, the sweet potato nugget. It definitely tasted of sweet potato, in other words, sweet. The texture was good. 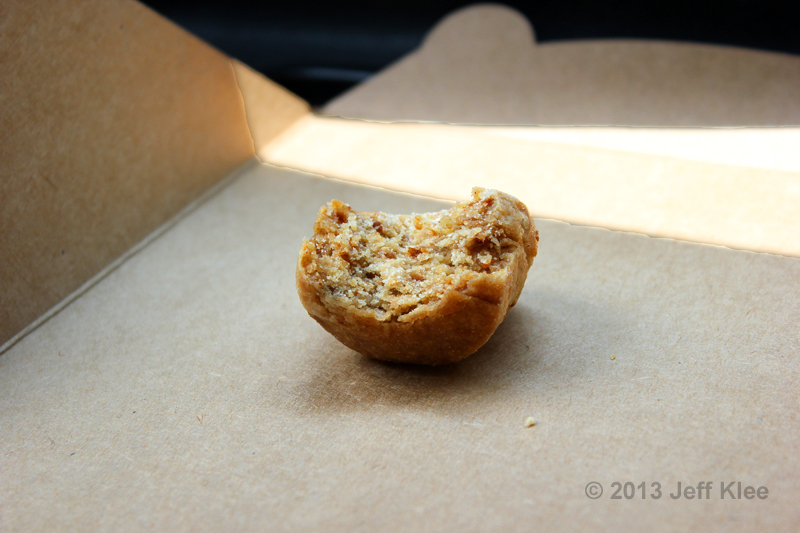 It was fairly dense but not dry as I would expect from a dense baked good. The sweet potato kept a reasonable amount of moisture inside so that you didn’t need to down it with a cup of water. I would consider getting the full sized version next time. I have a feeling this biscuit would be great with butter on top. The cannolo was fairly typical. The shell seemed a little softer and not as flaky as what I usually get, but it didn’t negatively affect the taste. The filling however was not very sweet. To me, that brings down my enjoyment of a cannolo. Without a sweet filling you’re left with a great texture, but limited taste. Other than the chocolate chips, the cream filling doesn’t stand out and the shells rarely have much of a taste on their own. To me, the filling is what makes a cannolo either great, or just bland. This one fell slightly in the latter category. I personally thought the lemon bar was great. 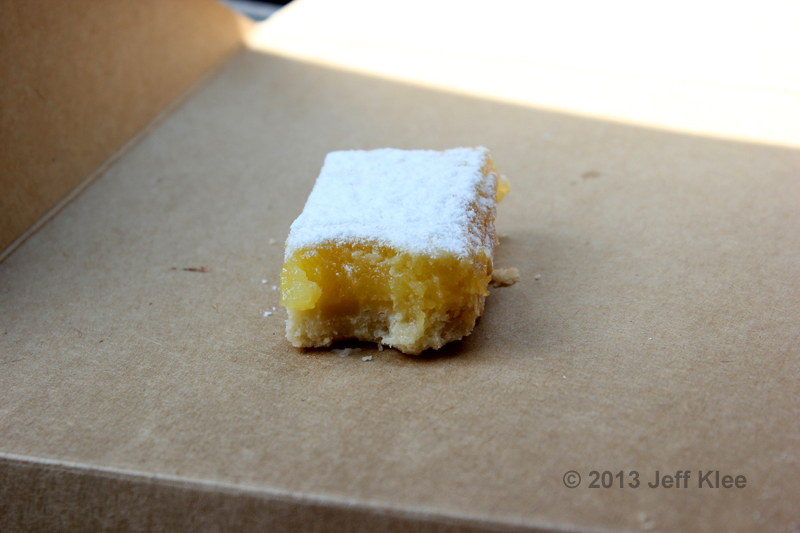 My wife on the other hand thought it was no different than any other lemon bars sold everywhere else. I have had very few of these, and none that I can specifically remember so maybe that’s why I thought it was so good. The lemon flavor was strong but not not too sour. The flavor did not immediately give an indication of being artificial, even if it was. The texture was also delectable. Not quite creamy, but not chewy either, it was a perfect consistency. The crust at the bottom was thin but gave just enough crunch to compliment the lemon filling. 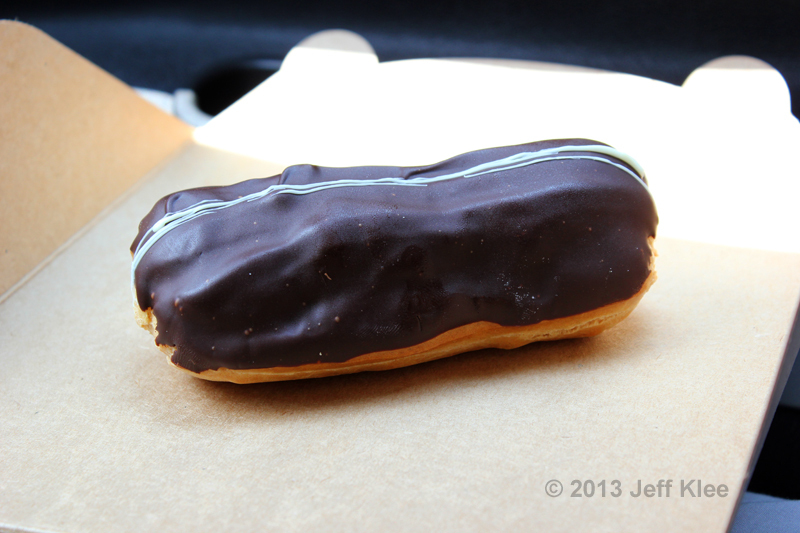 The eclair looked really appetizing with it’s thick and well coated cover. It was really large but still hard to pick up without getting chocolate on my fingers since it draped more than half way down the sides. Inevitably the cream filling inside was not what I hoped for. I would have loved to have found a chocolate filling inside, but would have been satisfied with a nice cream or vanilla flavored filling. 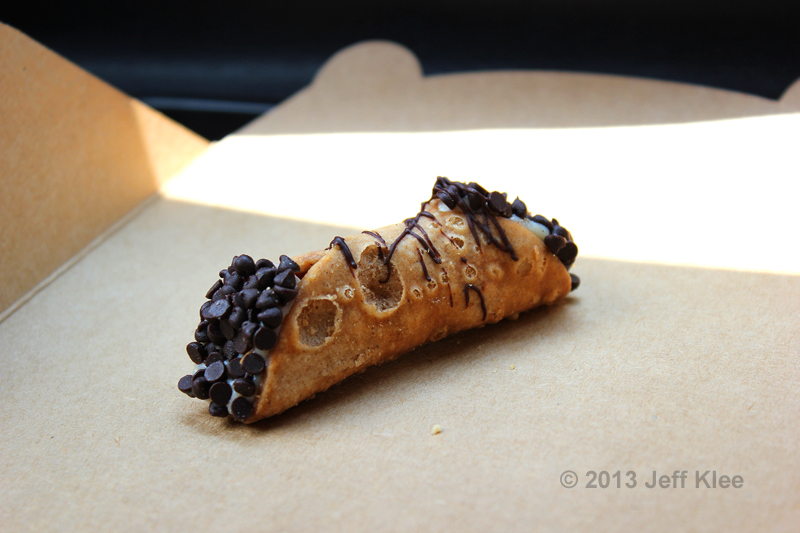 As it turned out, just like the cannolo, the filling was fairly bland. Luckily the thick chocolate coating added some noticeable flavor in each bite, but it was hard to overpower the drabness of the rest. Lastly, the cake shell didn’t feel fresh. 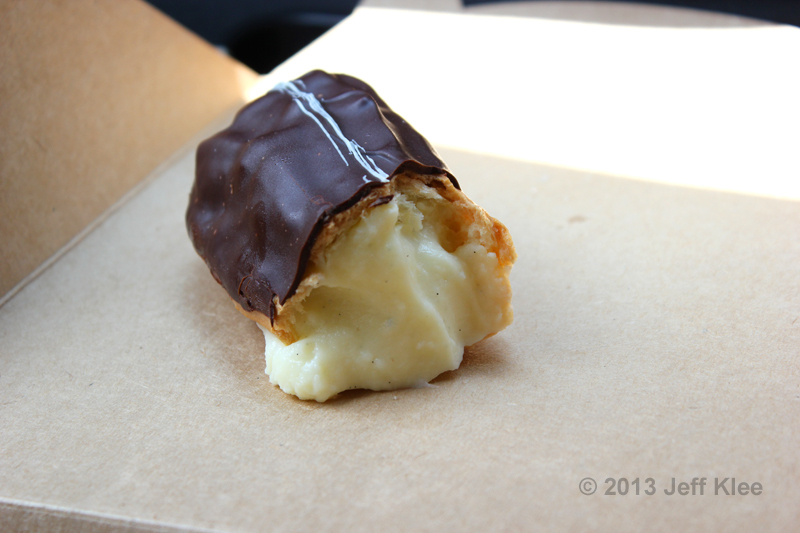 The stiffness was of an eclair that had been frozen and thawed, or just made a day or two earlier. The last item was saved for the end for a reason. I’m a fan of anything peanut butter, and I had high hopes for this. It was a fairly large and heavy bar with several noticeable layers. Biting in, I finally found my expectations met. On the bottom is the cookie-like “crust” made from many ingredients, some of which appear to be flower, butter, peanuts, and I believe I saw some coconut mixed in as well. Above the base are two thick layers of pure peanut butter and a viscous chocolate cream. On the top was a peanut “crumble” like you’d find on a cobbler. 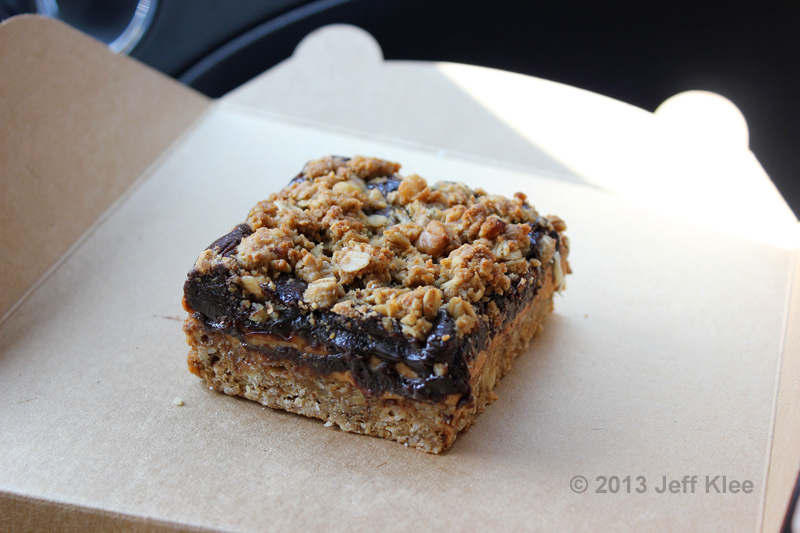 This bar had every texture from the crunchy crumble, to the creamy chocolate and peanut butter layers, with the base having a chewy composition. The peanut flavor was abundant in every bite. The thick peanut butter layer was distinct, both taste and texture, even though it only consisted of about 15% of the entire bar. Needless to say, this was a very filling dessert. 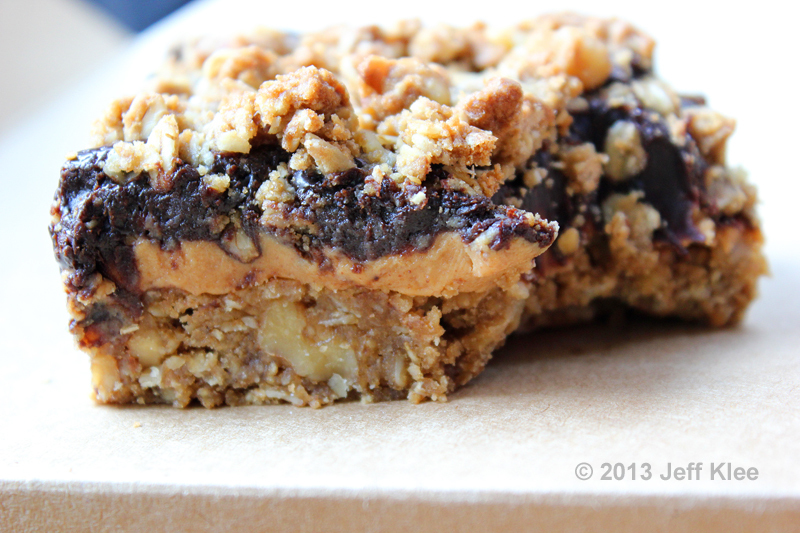 It combined many of my favorites: chocolate, peanut butter, cobbler crumble, and cookies. I may have to get this again and bring it home to heat in the microwave which I can only assume would improve it dramatically. 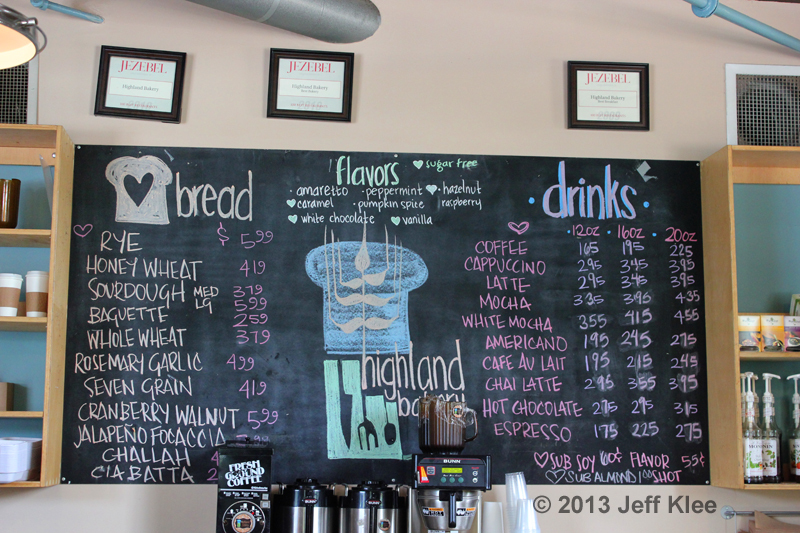 My first visit to Highland Bakery last year was fantastic. 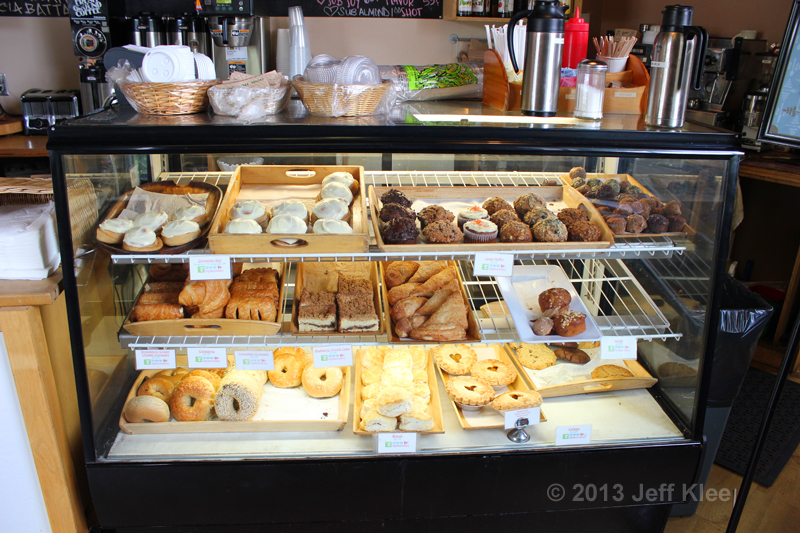 This visit only included bakery items as opposed to a full breakfast on my last visit. 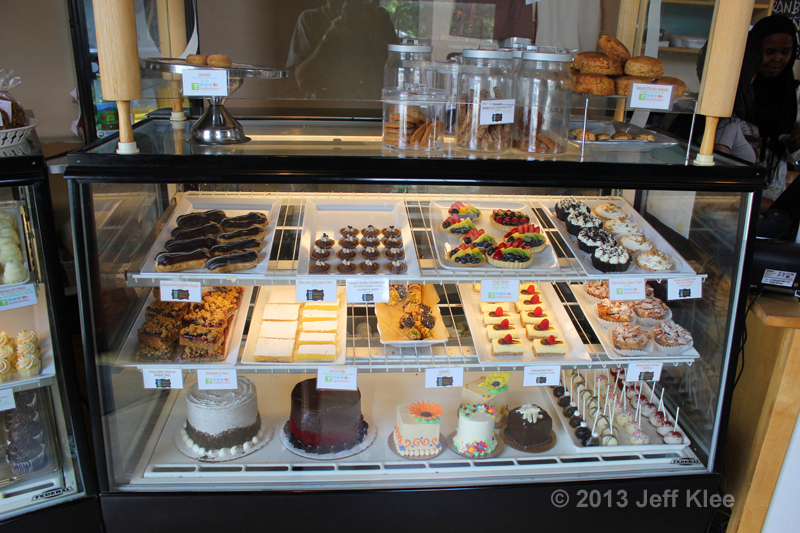 I was not as impressed this time, but I would like to continue to visit and eventually get a full review including all food that this bakery offers. While not everything today was spectacular, there were definitely a few high points. I think there’s a lot of potential here for some more amazing treats.